Conical Bore, Tapered Bore: These terms are used interchangeably. The drawing shows the bore design of the Classic Flute: the head is straight (cylindrical), joining a tapered (“conical”) midsection, followed by the foot (straight in my instruments). The design of this “talibore” varies among makers (whether a decreasing taper or a straight bore or an increasing taper). This bore style is used on all my diatonic instruments. The upper view shows holes that are drilled straight in as on a simple instrument. The lower view shows Toneholes that are shaped with a special cutter, resulting in a Profile and Undercut. The Old Masters used hand tools to produce these shapes on the finest instruments. This geometry improves all playing characteristics: a clear & buildable tone, speedy response, smooth transitions, stability, crisp ornamentation, and control of dynamics over the compass. This view shows the design of the Slender Tenon and Internal Cork (inside the mortise). With the old design (i.e., lapping on the outside of the tenon), pulling the slide out makes more of an endgap. Instead, the slender tenon (shown here) results in a better scale when the instrument is adjusted for tuning. If your instrument is built this way, please store it disassembled in order to maintain elasticity of the cork; a little cork grease, applied often, will ensure long, satisfactory service. The liner is synthetic cork, a superior material. 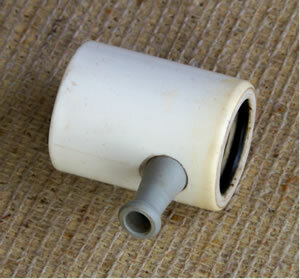 Here we see a similar design with Internal Cork; however, this socket is polished Stainless Steel. 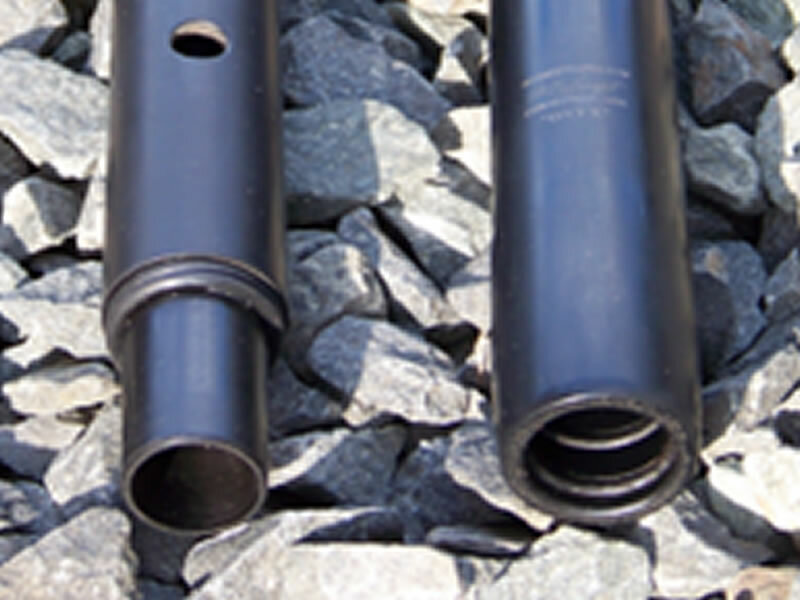 "ENFIELD"s barrel is integral with the long tuning slide: the barrel cannot crack or leak and is field-replaceable. The slide meets a brass receiver in the head; this Bimetal Design eliminates galling and stuck slides, guaranteeing years of free action. The Knurled Ring makes an easy grip with a smart look. 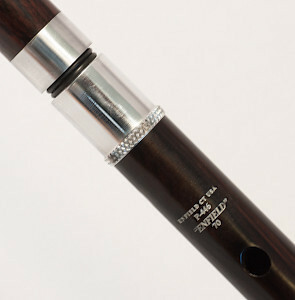 Store disassembled; keep the tuning barrel with the head for two reasons: to maintain elasticity of the cork; and to protect the tuning slide. "SIGNATURE" has a similar design. 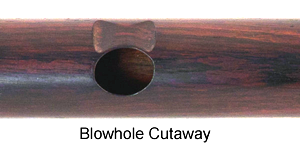 Note the Bow Tie Cutaway in front of the blow-hole. This feature makes the high notes easy and the low notes robust. Standard on "STEALTH" and "ENFIELD," this feature can be added to "SIGNATURE." Between the metal pieces, please note two o-rings which serve as Tuning Spacers; they do not seal the slide. With these o-rings in place, the instrument will play on a good scale for most people. They mark a convenient setting of the tenon or slide's position, about 2.5mm out (so you can "plug and play"). If you need to play a little sharper, try removing (or discarding) one or both of the o-rings. The polymer instruments, "ONYX", "BLACK PEARL" and "UMBRA," all feature a Slender Tenon and Internal O-Rings (inside the mortise). With the old design (i.e., lapping on the outside of the tenon), pulling the slide out makes more of an endgap. 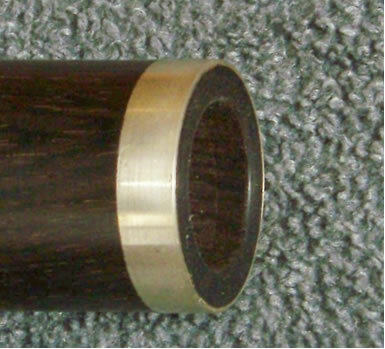 Instead, the slender tenon (shown here) results in a better scale when the instrument is adjusted for tuning. All these should be disassembled for storage so the joint doesn't seize; a little cork grease, applied often, will ensure long, satisfactory service. The o-rings are replaceable (but they'll probably last a lifetime). A leading feature of "ONYX" and "BLACK PEARL" is the Curved Windway. This feature tends to shed moisture and reduce clogging. The windway is widened at the entry (at the tip) to improve both highs and lows, whose balance is set during voicing. Although these insweeps make the tip a little bulkier, the increase in performance sets these instruments apart from the competition. Many of my instruments have Offset Toneholes (see the "ONYX" at left). For comfort, the A-hole (left #3) is drilled at 12.5° off center as a rule. The instrument shown is drilled for a right-handed player. Left-hand or zero-offset is available by special request at no charge. On the "ENFIELD" model fife, the Crown Cap is made of acetal (like Delrin). A fife belongs on the parade route, but that's where it can be dropped on the hard pavement, resulting in a chipped crown. Happily, this high-impact polymer is long lasting. 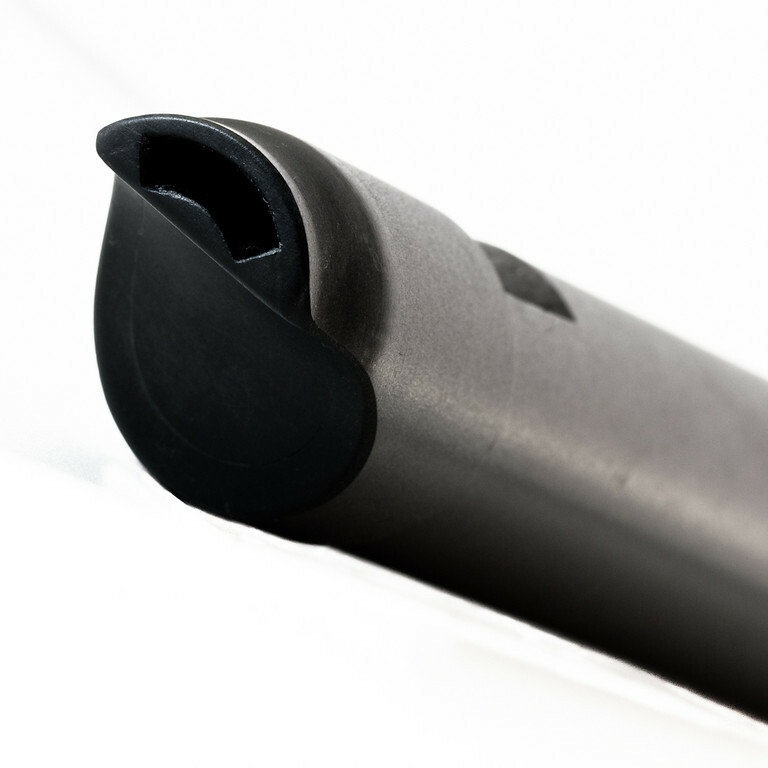 The Endstopper (the bore 'cork') is also acetal, giving a Hard Face for a full sound. For all "chromatics" (i.e., under all padded keys), the pad seats are not sunken but raised as an integral boss. Raising them re-aligns the harmonics to support a powerful tone. 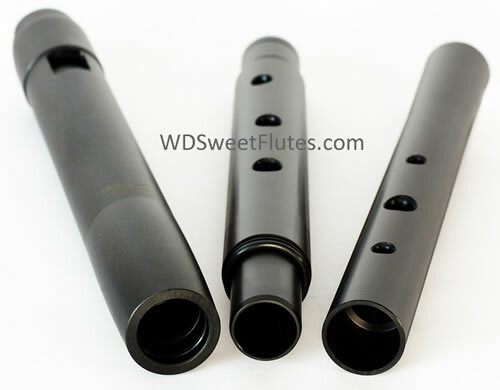 The Sideblowing Adapter puts the pennywhistle in the same orientation as a flute for ease of playing. When holding the instrument this way, the lowest holes are easier to reach and playing is much more comfortable over time. For the best tone quality, play the "ONYX" without this accessory. 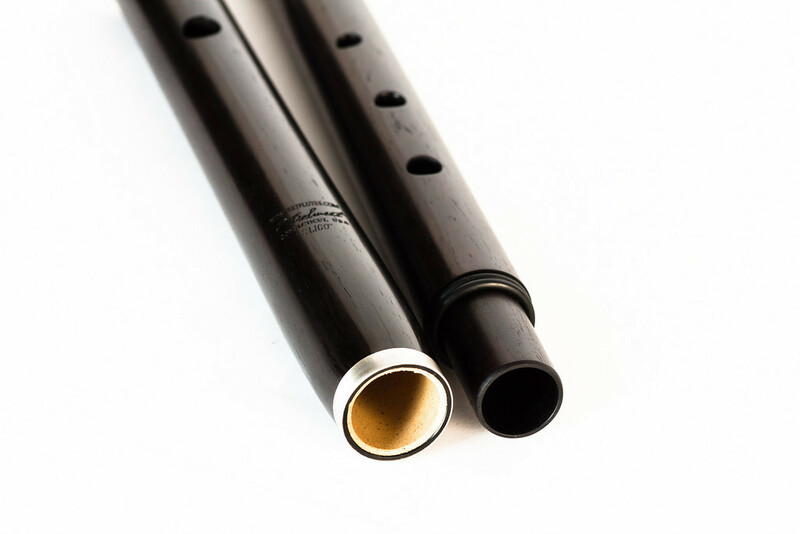 Note: sometimes a wooden flute can shrink around a metal tuning slide, resulting in a crack. To prevent this problem, "CLARE" cushions the silver slide in a sleeve of synthetic cork, anchoring the parts while allowing the wood to expand and contract normally. This construction is ideal for tuning the instrument without distorting the scale. Also shown are the Half-Dome Rings. This view shows tubing used decoratively as Flat Silver Bands (SLIGO and LYRIC). "SIGNATURE's" head has a silver liner which extends to make a long Tuning Slide. This slides inside the Barrel which is made of polished stainless steel. This bimetal design eliminates galling and stuck slides, providing years of free action. The barrel's lower end has a metal receiver for the centerbody; the result is a contiguous metal barrel that cannot crack or leak. Drilling Toneholes on the Medullary Rays (shown) reduces the chance of cracking.